This self-employed tax calculator will estimate your 2018 Medicare and social security taxes based on your forecasted income, calculate the deduction that will lower your Adjusted Gross Income. Plus, the calculator also has a built-in feature that will annualize income forecasts based on non-annual amounts. And finally, included in the results will be a printer friendly, auto-completed 2018 Self-Employment Tax and Deduction Worksheet that can then be used to complete the 2018 Estimated Tax Worksheet (Schedule SE - Form 1040). Disclaimer: This tool is for estimation purposes only. Be sure to consult with a qualified tax expert before deciding how much to set aside for self-employment taxes. Estimate your self-employment taxes based on your forecasted income, plus calculate the deduction that will lower your Adjusted Gross Income (AGI). Enter your expected net farm profit or loss. Enter as a dollar amount but without the dollar sign or any commas. Or, if you would like to enter a non-annual amount and have the calculator annualize it for you, expand the description in this row to enter the profit amount per selected period. At the time of filing, this amount would be from Schedule F, line 34, and farm partnerships, Schedule K-1 (Form 1065), box 14, code A. If you will receive farm income and also receive social security or disability benefits, enter the total of the CRP (Conservation Reserve Program) payments you expect to receive. Enter as a dollar amount but without the dollar sign or any commas. Enter your expected net profits subject to self-employment tax. Enter as a dollar amount but without the dollar sign or any commas. Or, if you would like to enter a non-annual amount and have the calculator annualize it for you, expand the description in this row to enter the profit amount per selected period. At the time of filing, this amount would be from Schedule C, line 31; Schedule C-EZ, line3; Schedule K1 (form 1065), box 14, code A (other than farming); Schedule K1 (Form 1065-B), box 9, code J1. If you will receive income as a church employee, enter the total income you expect to receive. Enter as a dollar amount but without the dollar sign or any commas. At the time of filing, this will be from the Form W-2 you receive from the church. If you will receive income from wages, tips, and/or railroad retirement (tier 1), enter the total amount you expect to receive. Enter as a dollar amount but without the dollar sign or any commas. Enter your expected unreported tips. Enter without dollar sign or any commas. At this time of filing, this amount will be from Form 4137, line 10. Enter your expected unreported wages. Enter without dollar sign or any commas. At this time of filing, this amount will be from Form 8919, line 10. Based on your entries, this is the estimated medicare taxes you will owe, which is 2.9% of your expected profits. Based on your entries, this is the estimated social security taxes you will owe, which is 12.4% of your expected profits (up to a maximum income of $128,400 for 2018). This is the combined total of your medicare and social security taxes, which is 15.3% of your expected annual profits. This is the amount that can be used to reduce the amount of taxable income when figuring your total estimated federal taxes for the year. The deduction is equal to 50% of your self-employment tax. If applicable, enter your expected farm profit for the year. the description will reveal a mini-calculator for converting non-annual farm profits into annual profits. If applicable, enter the annual total of any Conservation Reserve Program payments you expect to receive. Enter your expected business net-profit for the year. the description will reveal a mini-calculator for converting non-annual profits into annual profits. If applicable, enter your expected church employee income for the year. If applicable, enter your expected social security wages and tips for the year. If applicable, enter your expected unreported tips for the year. If applicable, enter your expected unreported wages for the year. 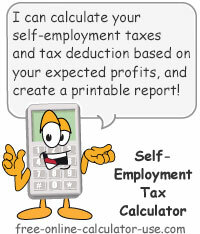 the "Calculate SE Tax" button and scroll down to see the results, which will include a completed Self-Employment Tax and Deduction Worksheet, followed by a button to open the worksheet in a new window for printing. What self-employment tax is, what the rates are, and why I feel they are unfair to sole proprietors. If you are employed by a company, your employer is required to withhold Medicare and social security taxes from your paycheck. Nothing new there, right? However, what you may not know is that your employer is also required to match the Medicare and social security taxes being withheld from your paychecks. In other words, the Medicare and social security taxes paid by your employer are double what is being withheld from your check. Of course, if you are your own employer (self-employed), then guess who gets to pay the Medicare and social security match amount? That's right, YOU DO! So self-employment tax is basically the matching amount you pay as your own employer, plus the tax amount you pay as your own employee. Furthermore, even if you earn wages from an employer, but you earn more than $400 annually from a side business of your own, you will still need to pay self-employment taxes on the profits your side business generates. What is the Self-Employment Tax Rate? Note that the social security tax rate is applied to a maximum income of $128,400. Also, note that higher incomes may be subject to an additional .9% Medicare rate for Medicare wages earned in 2018. While a self-employed person pays twice the Medicare and social security taxes that an employee pays, one small consolation is that the IRS allows the self-employed person to deduct 50% of his/her self-employment taxes from income that is subject to federal income taxes. Why do I consider this deduction to be a small consolation? Because if you are self-employed and paying, say $4,000 per year more in Medicare and social security taxes than an employee pays, and you are in a 25% tax bracket, the self-employment deduction means you are still paying $3,000 more in Medicare and social security taxes than an employee who is making the same amount of money (a $4,000 deduction would only result in a $1,000 tax savings). From my perspective, it's most certainly NOT fair. Unfortunately, there are far more employees than there are self-employed individuals, so we don't have unions and lobbyists fighting for our rights in Washington. Nor do we have the numbers to elect politicians who will represent our interests equal to those of "the entitled" or of the mega-corporations. But as unfair as self-employment taxes are, I still consider having to pay them as being the lesser of two evils. I would much rather pay an unfair share of taxes than enslave myself to a boss -- especially considering some of the bosses I've had (egos much larger than their IQs).